Christyn Williams’ first regular season game with the UConn women’s basketball team is three months away, but there’s no doubt she is part of the Huskies’ family. 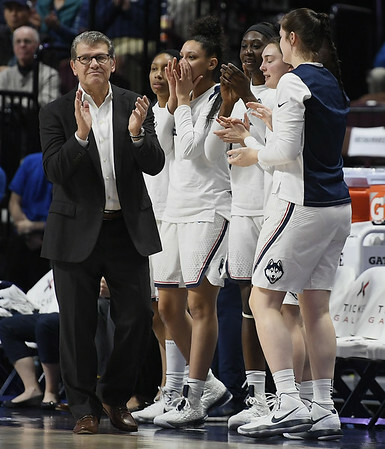 The freshman guard from Little Rock, Arkansas, raised eyebrows in June at coach Geno Auriemma’s charity golf tournament when she predicted that UConn would win the 2019 national championship. The Huskies have seen their last two bids for a 12th NCAA title end in overtime of the Final Four semis. Six former Huskies - all All-Americans and multiple national champions in their time in Storrs - had Williams’ back when asked what they thought of the prediction during their stops at Mohegan Sun Arena with theie respective WNBA teams. Of course, it was Stewart - who, when she committed to UConn in January 2011 - told Auriemma that she wanted to win four national titles. The Huskies reached that goal and she became a three-time national Player of the Year and the first four-time Final Four Most Outstanding Player in the unprecedented run. Sun forward Morgan Tuck and Las Vegas Aces guard Moriah Jefferson were All-Americans as they and Stewart became NCAA women’s basketball’s first and only four-time champs. It was what they wanted when they came to UConn. But they, unlike Stewart, kept it quiet. They liked what they heard from Williams. For Seattle guard Sue Bird, the 2002 national Player of the Year and two-time national champion at UConn, expectations is the key word. The Huskies have lost three times in their last 197 games. Three starters return from last season’s 36-1 club. The additions are Williams and fellow high school All-American Olivia Nelson-Ododa. They led Team USA to a gold medal at the FIBA Americas U-18 Championships last week. With Williams’ arrival, the Huskies will have three consensus high school Players of the Year, with Katie Lou Samuelson (2015) and Megan Walker (2017). Eighteen years ago, a player from Chino, California, came across the country with the same determination that Williams has. Williams will play her first regular season game for UConn on Nov. 11 when it hosts Ohio State. The non-league schedule includes road games against 2018 national champion Notre Dame, 2018 Final Four participant Louisville, and perennial power Baylor. The 2019 Final Four is in Tampa. The Huskies and Williams expect to be there. But, as Tuck agreed, what is she supposed to say? We’re hoping to get to the Sweet 16 and finish in the top three in the conference? Posted in New Britain Herald, UConn on Monday, 20 August 2018 14:55. Updated: Monday, 20 August 2018 14:57.